One of Delhi’s signature winter street foods is Shakarkandi. We all breathe a sigh of relief in the autumn when the spicy sweet potato vendors appear: we know the cooler weather is truly on its way. As with much Indian street food, a plate of Shakarkandi is a tapas-sized portion and ideal for those between meals dilemmas. I particularly love ordering a plate late afternoon when dinner seems a long way off. I ordered up this plate outside Lodhi Gardens after a Republic Day walk last Tuesday. I love watching the ritual of assembling the Shakarkandi – the sweet potato is first plucked from the small pile warming on a pile of coal, slowly peeled, cubed and tumbled into a plate. 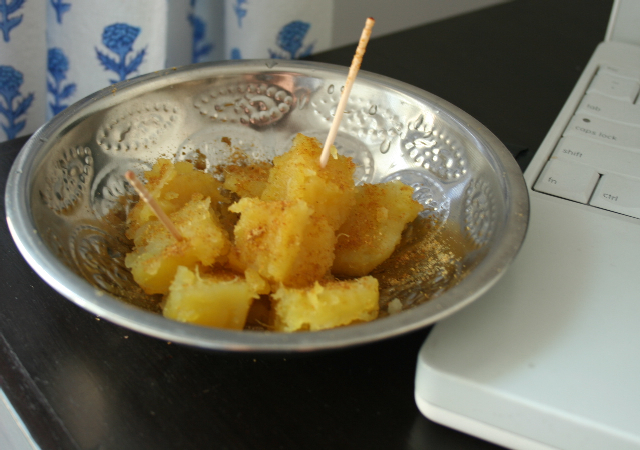 The cubes are then liberally sprinkled with masala and lemon juice before being mixed with an expert flick of the wrist. 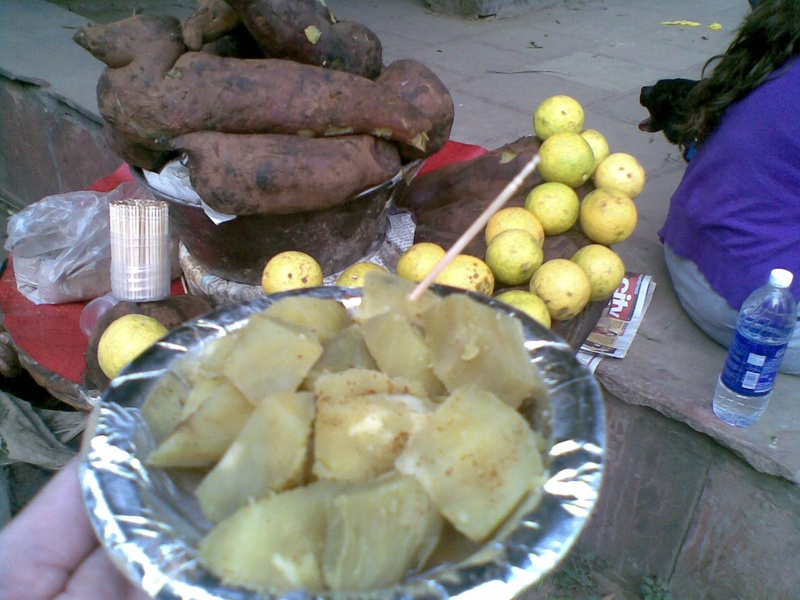 Shakarkandi is one of the few guilt-free street snacks – no ghee, no sugar, no oil; pure, simple and wholesome – roasted sweet potato sprinkled with masala and drenched with lemon juice, some of the fancier vendors add a few slices of kamrakh (star fruit). Yet it manages to feel like a mini-feast, an instant cure for whatever ails you. Making shakarkandi at home couldn’t be easier and yet I’d never got round to it until a couple of days ago. I’d had a late breakfast so wasn’t really looking for a huge lunch but I knew I wouldn’t last till dinner. A simple roast sweet potato seemed to fit the bill. I had a pack of Chaat Masala (a special blend designed specially for street snacks) from Noori Spices in Chitli Qabar in Old Delhi that I was dying to try out. The Noori blend contains coriander, yellow chilli, cumin seed, dry raw mango, black salt, sea salt, kachri powder (kachri is a type of cucumber I think), fennel, cardamom, ginger powder, bay leaf and nousadar (no clue what this is). Pierce the sweet potatoes a few times to stop them exploding in the oven. Roast for about 30-45 minutes – they should feel soft but not mushy when pierced with a knife. Peel the sweet potatoes and cut into dice, sprinkle with masala and lemon juice and dig in. Kacchri indeed looks like a tiny round cucumber, it is used as meat tenderizer and a flavour enhancer. This is one of my favorites too. I’ve made it when back home in the US. It came close although it misses something roasting the potatoes in the oven instead of over coals but sometimes you’ve just gotta make do with what you’ve got! The specifics of spices and ingredients(Kamrakh) are so precise. I dont find them in indian write ups. Coming from a foreigner, this is really admirable. Even some of our tv food show hosts use the wrong words saying pakao instead of bhoono or many such mistakes. Your language is just perfect. True – the home version is still pretty good though! Narender – in the spice mix the Kacchri must be dried right? I don’t like the sound of of Ammonium Chloride! as a matter of fact I have never come across a fresh kacchri, unlike you. I only know the dried powdered stuff. If you look at the contents of MDH chaat masala, it is listed there. Be sparing in the use of Kacchri powder, it is supposed to be a meat tenderizer as well. I once used it unwisely on ground beef (which really did not need it), and the whole mess turned out to be very greasy, bound all the fat to the meat. Had to bin the meat. Ammonium chloride – has been in use for ages in India as Naushadar. If you google it, WHO has guidelines regarding its use in food. There is also references to salty licorice (high in amm chloride). It has been described as tasting something like common salt but with a spicy overtone. It is just another chemical like Sodium Chloride ! One question, the answer of which may be obvious to others: do you mean 200 degrees fahrenheit or celsius? N.A. 200 F is NOT it obviously, water boils at 212 F. So obviously it is 200 C, also kindly bear in mind that India is now METRIC, so they dont use Fahrenheit but Celsius.